Looking to have Gene’s Restaurant cater your next event or have a question about the menu? 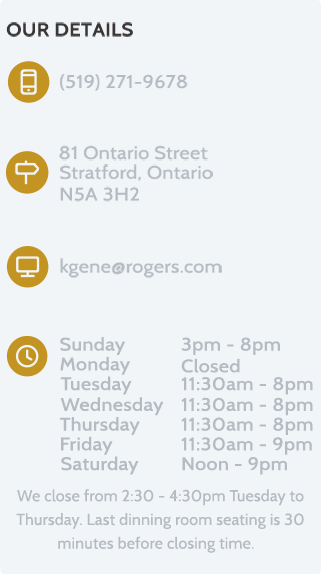 Feel free to use any of the contact options below to get a hold of us. Please note that we cannot accept orders through our contact form. For all orders, please give us a call and we’d be happy to help you. Although reservations are generally not needed, we wil take them. Large parties of 10 or more should book in advance to ensure seating. We accept all major credit cards, including Visa, Mastercard and American Express. We also accept cash. If you are paying via debit or credit card for your delivery, please let us know when you order so that we can ensure our drivers have a portable payment method on hand. Cost for delivery is $7 within Stratford. Delivery outside of the area will be charged whatever the carrier is charging. Delivery is usually 45 – 60 minutes. Do you cook with MSG? MSG occurs naturally in a lot of foods and some people have a sensitivity or reaction to the substance. Common mild reactions to MSG can be being thirst, redness in the face and headaches. MSG is common to a lot of Chinese foods and fast food restaurants. It is often added as a “flavour enhancer”. Some items at Gene’s Restaurant do contain MSG notably egg rolls, spring rolls, gravy, and most stir fry items. Since most of the stir fry are made “short order” and from scratch, the MSG can be left out if requested. Please inquire with the server if MSG can be left out of the items that you request. 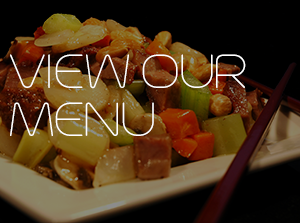 You can also download our take-out menu here.